The explosive use of smartphones, tablets and other handheld devices bring increasing demand of consumer preferences, creating an accelerating dynamic for designers and manufacturers to develop sleeker, durable and more functional offerings. With touchscreens getting bigger and bigger, dropping a phone or a tablet on a floor often ends with an unwanted crack on the screen. SABIC has introduced new LEXAN™ film solutions to help OEMs address consumer’s increasing demand for stronger screens that can help to protect the display from scratches and breakage. 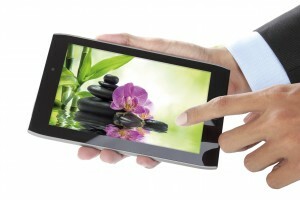 SABIC’s new LEXAN OQ6DA film portfolio has been engineered to meet specific scratch resistance and impact performance requirements for consumer electronics making it an excellent candidate for flat touchscreens of smartphones and tablets as well as lenses for portable electronics, overlays and keypads. SABIC’s new material solutions – which are lightweight and virtually unbreakable – include either both or one side hard-coated polycarbonate sheeted films with excellent abrasion resistance and optical clarity. Compared to glass or glass-based screens available in the market today, SABIC’s new LEXAN OQ6DA film materials provide OEMs greater freedom to create lighter and tougher screens. Dual or single side hard-coated products offer 4H pencil hardness, providing excellent resistance to scratching, marring and abrasions. They are excellent candidates for die cutting, printing and metallization. Additionally, they provide excellent chemical resistance and more than 90% light transmission. LEXAN OQ6DAW film offers low warpage. For flat lenses and keypads, the portfolio offers dual-coated LEXAN OQ8DA film with abrasion- and chemical- resistance and excellent printability and dual-coated LEXAN OQ6DA film with high pencil hardness and printability. For A covers with or without built-in lens, the portfolio offers LEXAN 6060 film with 3D formability, LEXAN HP92T film with 2.5D formability and high gloss. These products are available globally from SABIC. More information about SABIC’s range of film solutions for the consumer electronic industry can be found on the website www.sabic.com/sfs. It has significant research resources with innovation hubs in five key geographies – USA, Europe, Middle East, South East Asia and North East Asia. The company operates in more than 50 countries across the world with around 40,000 employees worldwide. the hydrocarbon gases associated with its oil production as the principal feedstock for production of chemicals, polymers and fertilizers. The Saudi Arabian Government owns 70 percent of SABIC shares with the remaining 30 percent publicly traded on the Saudi stock exchange. Compared to glass or glass based screens available in the market today, SABIC’s new LEXAN OQ6DA film materials provide OEMs greater freedom to create lighter and tougher screens that are resistant to scratches and breaks by accidental drops onto the rough ground. Dual or single side hard-coated products offer 4H pencil hardness, providing excellent scratch- and chemical-resistance. They are excellent candidates for die cutting, metallization and printing.